Hi all, and welcome to another Fusion Challenge! 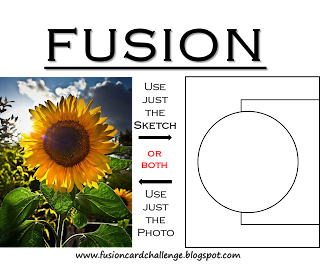 I typically run, quickly, from floral cards because I have a much harder time with "pretty," so this huge sunflower scared me for several days. I had to abandon the photo and just go right for the sketch, which gave me an excuse to play with the Papertrey Ink Rustic Wreath die that I haven't used yet. Right away I think Darnell would be pleased with me using NBUS! I backed the wreath with patterned paper over the chipboard base, and glued a thin, disk magnet to that. Were I to make these again, I would use two magnets so it's stronger, and so you have more control on hanging the wreath straight. Then I took a thin magnet (I always save the promotional magnets from realtors, politicians, insurance companies, etc.) and adhered that to the card base. Now you can just stick the wreath where ever you want it on the card. And, more importantly, remove it for later. For the wreath I used four layers of the PTI Rustic Wreath Die, flipping some upside down so the leaves face a different direction (just saw this from Laura yesterday!) I also bent about every other leave up to give it more dimension. Since it's for Halloween, I like that the individual leaves don't show too much for this wreath. This is also the first time I've used the small bow from MFT, AND the sentiment, which is from the recent Winnie & Walter release. More NBUS! And here it is on the REAL side of my refrigerator. The one that's not clean! Let's face it, this may just be an excuse to show off my collection of adorable babies in our family!! 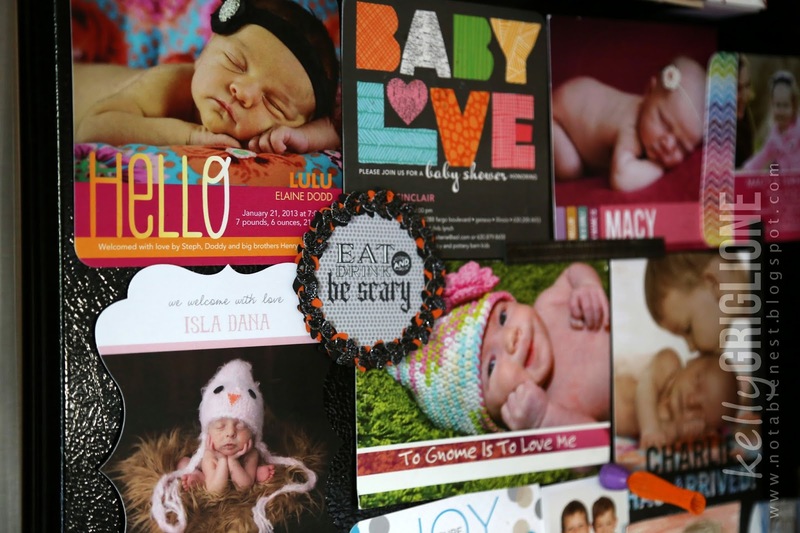 It doesn't hurt that their parents all use Tiny Prints for announcements and parties. The quality of their paper is amazing! 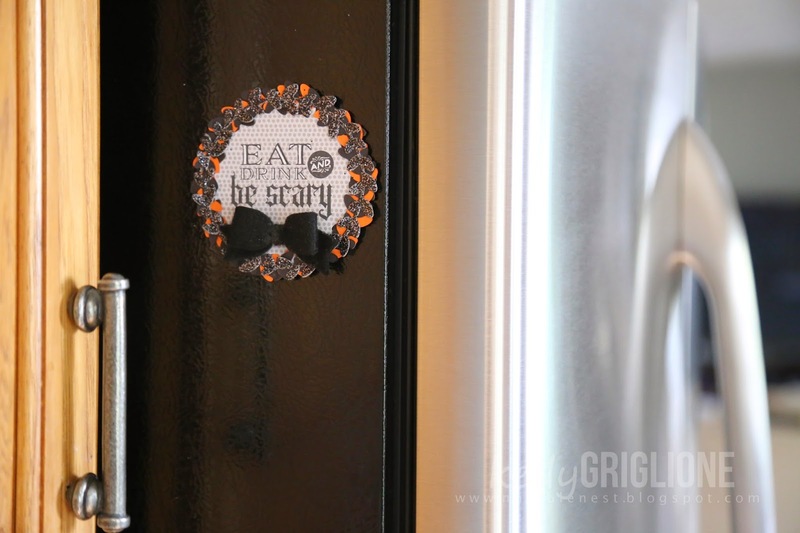 You may not have noticed, but I removed the black felt bow from the magnet when I had it on this side of the refrigerator. The more white space the better with all these cute babies stealing the show! Thanks so much for stopping by! I hope you get a chance to check out the Fusion Challenge and perhaps link up a card! Do You Back Up Your Blog?!? A friend of mine just started a new food blog. After being so busy over the summer, she finally had the time to work on it yesterday. Horrors of all horrors, she accidentally deleted it!! The whole thing. After waiting for a half hour to talk with WordPress tech support (can you imagine how that must have felt?!) they were able to get it back for her, but it sounded like that might not have been the case if she had waited until tomorrow after their servers had updated. After celebrating with her, it dawned on me that I haven't backed-up the content of my blog. Ever. The thought of losing 450 posts and probably months of my life is quite overwhelming. Luckily, it's very easy to make a back-up if you use Blogger. And quick. We're talking minutes. All you do is click on Settings in your left-hand sidebar, then Other. At the top of the window click on Export Blog (NOT the one next door, "Delete Blog"!!) Here is where you can save the file to your hard drive. My next step will be to save the file to my external hard drive. THEN I will need to remember to save a new copy periodically. At least I have the last 2 1/2 years covered. Whew! 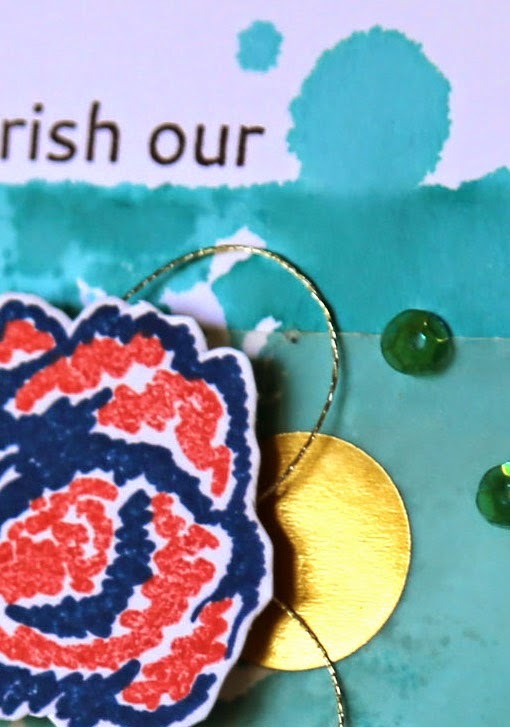 I was tagged by the seriously amazing Tasnim last week in the Creative Blog Hop (another Cher of the card-making world ... type in her first name in google search and her blog comes up FIRST after two news-related sponsor posts!) After being hooked on Tasnim's blog from the very first post, I was thrilled to hear that she was going to start a new stamp company. 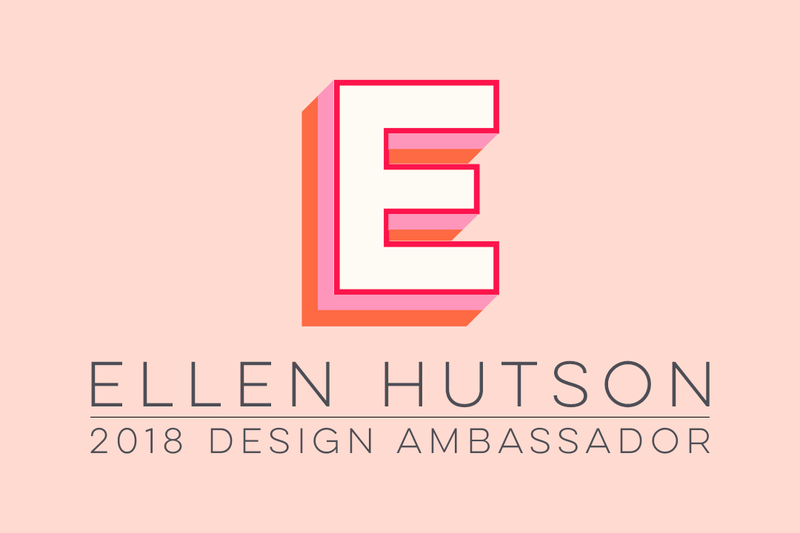 Even with my high expectations for Altenew, I could never have imagined the quality and spirit of her and Jen's designs. So not cookie-cutter. So inspiring to play with. Really just amazing, like her! Big apologizes go to the highly creative Miriam who had tagged me over a month ago and had even written her post, but with being on a vacation I didn't get my future tags lined up in time : ( Miriam is another stamp designer (for Neat & Tangled) known for her wildly popular on the corner of set, Star Wars sentiments set, stoplight set, and clouds set (not the official set names, just what I think of them as!) Every card she makes has a little twist (or two) to make you want to note it for future reference. She's an awesome and supportive blogger and friend. More apologies are in order to Lyndal who also asked me to join the blog hop but I was still feeling really bad about not completing it for Miriam, and I was right in the middle of getting ready for my son's Nerf Wars birthday party. Yep, having twenty 10-year-olds coming over to your house is enough to make anyone panic, I don't care how together you are!! 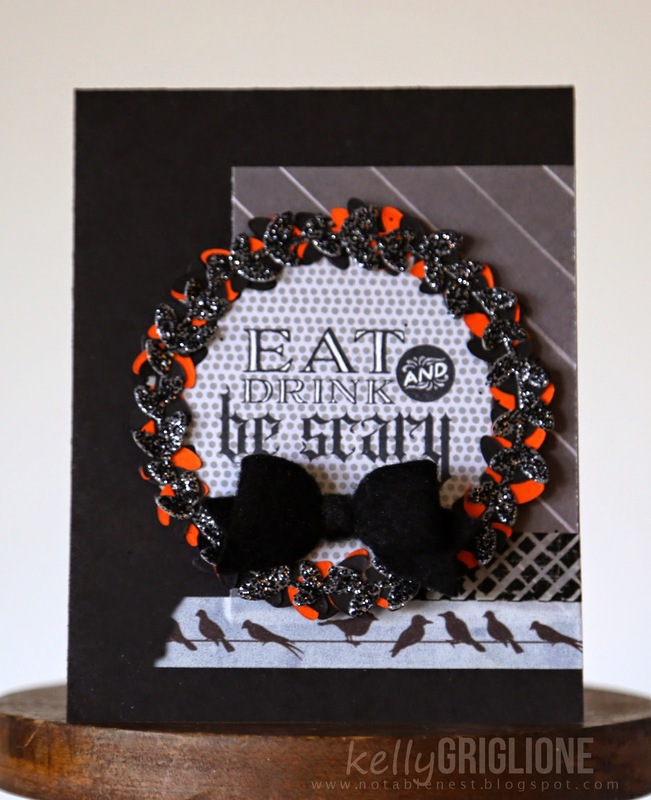 Lyndal is not afraid to try anything in her card design, and I absolutely love that about her! 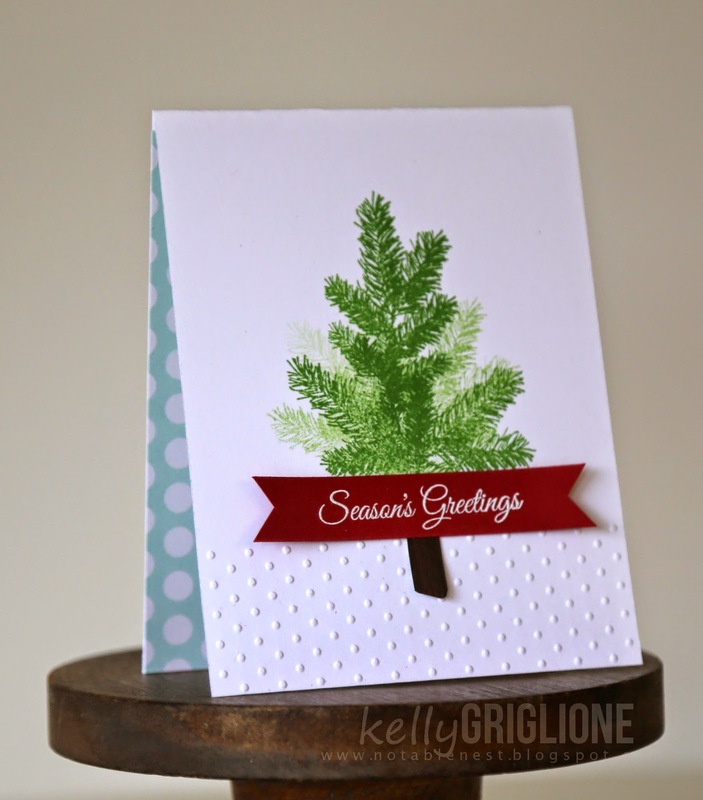 Check out her recent post for Winnie & Walter where she's created seasonal shaker cards using their cut files. Didn't I tell you they were fabulous? Love them all!! I'm currently working on a few cards for publication, a new product release for Winnie & Walter (something other than stamps!!! ), and my son's Nerf Wars party thank you notes. WARNING: what you are about to see may be painful and cause stomach aches. View discretion advised. Not so terrible anymore. I know exactly where everything goes. Plus my craft room is upstairs, FAR AWAY from any potential visitors (aside from the neighborhood kids who like to hide in there even though I chase them out every time). I've somewhat cut myself off from Pinterest. It was just too easy to get lost in a creative crumb trail. So my inspiration comes from packaging, children's books, ads in magazines, etc. Last year I started putting together a small idea-generator book that would show examples of my favorite ways to do something different. Totally simple, just a few sheets of folded over cardstock tied together with fiber. 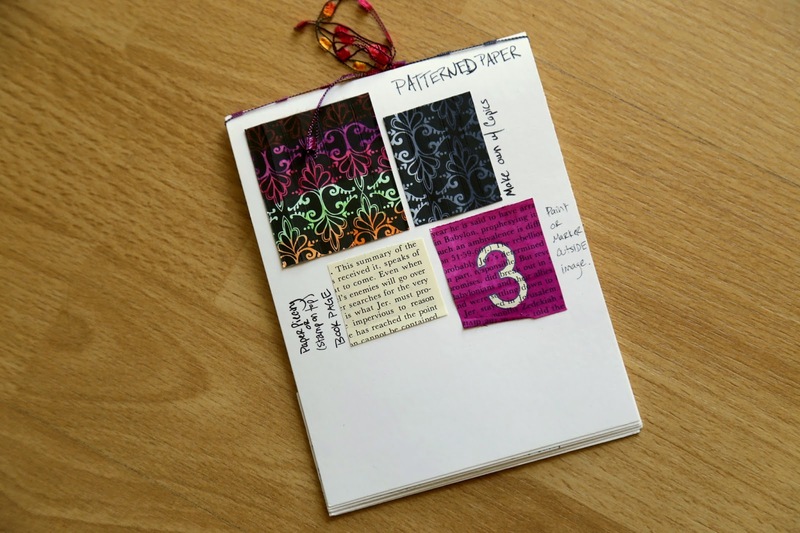 This particular page has ideas for patterned paper: take a b&w patterned paper and color it with copics to get colored patterned paper, use book pages as patterned paper, and stamp an image on patterned paper and color all around the outside of it. Any of my scraps that I didn't want to throw away typically had a technique that I was happy with, so materials for the book were easy to gather. Once the holidays are over I'd like to pick that up again and finish it. 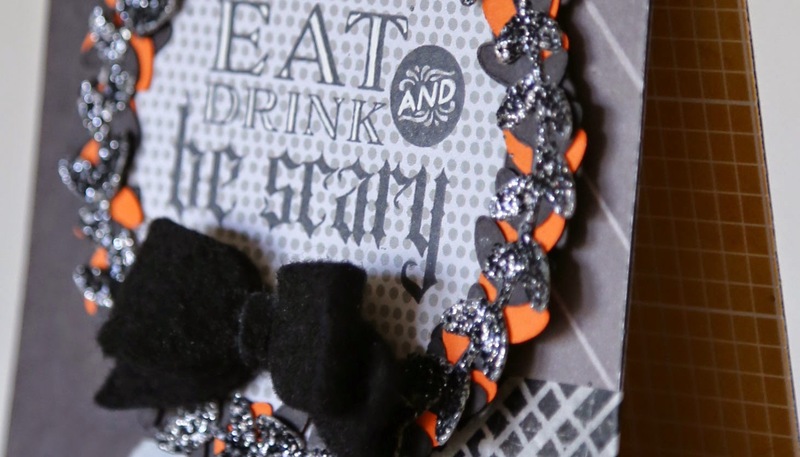 Evidence of the Autumn tree card, the sympathy card and the Halloween bats card are all on this page. I like coming up with card designs when I'm not sitting at my desk. It seems to take the pressure off because I can't get started on something even if I wanted to. If I'm sitting at my desk and am not coming up with anything right away, I'll start looking at the time and that's never productive. Or, I'll panic and just start making something. That's a toss up if it turns out or not. If I don't have a design sketched, I'll almost always try it on copy paper that's been folded into quarters first. Here are my trials from a recent Altenew feature. I rarely finish a card in under an hour. 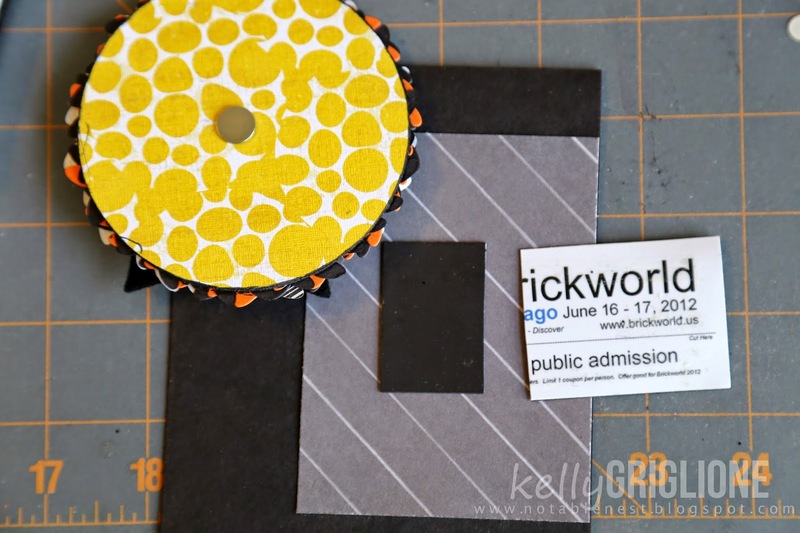 I tried the 10 minute craft challenge 2 or 3 times, and each time I had already sketched out my card design and had all the supplies in front of me, so I'm not even sure that it really counted. I started out making clean cards with a twist (technique or construction-wise). Recently I've been trying to focus more on my composition vs. coming up with new ways to do things, since I think that suffered in the past. Once I get better at composition I'd like to go back to the clean & a twist cards. You might think that's patterned paper at first, but oh-no, those are all tiny die cut hearts that have been colored and adhered back into place. What?!? I know, right? Love, love, love. Anyway, thanks for stopping by! Hope your week is off to a great start. Hi Folks! We're at the end of a huge release for CAS-ual Fridays Stamps ... on this final day we're revealing the new Hanukkah Fri-Dies! 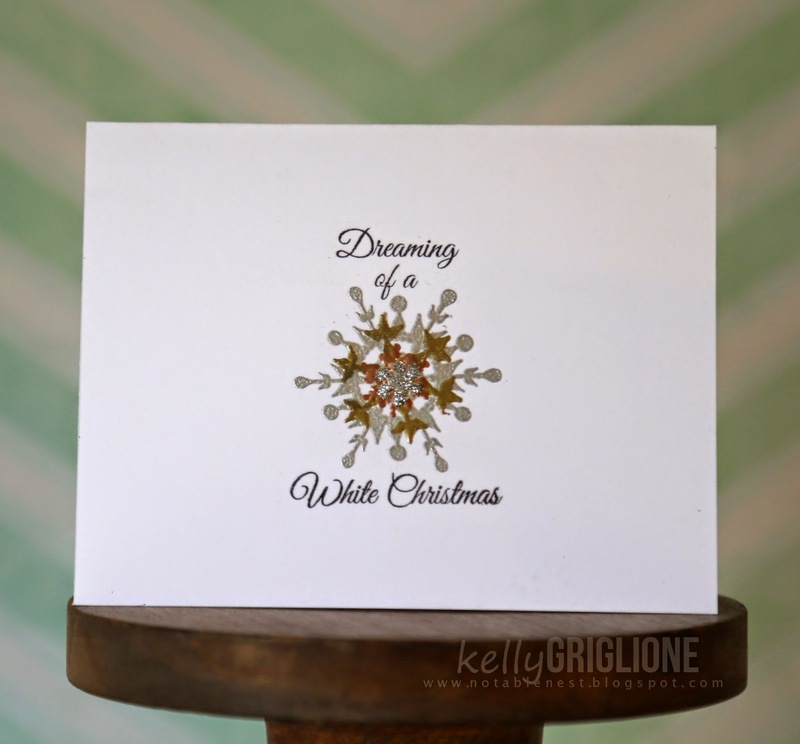 For this card I've combined it with the coordinating 8 Happy Nights stamp set. I used thick glitter paper for the star of David and the die cut through very well. The ink background is from watering distress ink on an acrylic block and "smooshing" it (not smashing it, right Bobby?!) on the card base. Then I stamped the Dreidel song lyrics along the side a few times without reinking. The remaining die cuts and clear sequins are added in a cluster. I can't wait to send this to my Jewish friend and her family! They will be so surprised to get a Hanukkah card from me, I'm sure. All stamps and dies from this week will be at CAS-ual Fridays Stamps on Saturday! Thanks for looking, and for stopping in all week! Hi Folks! 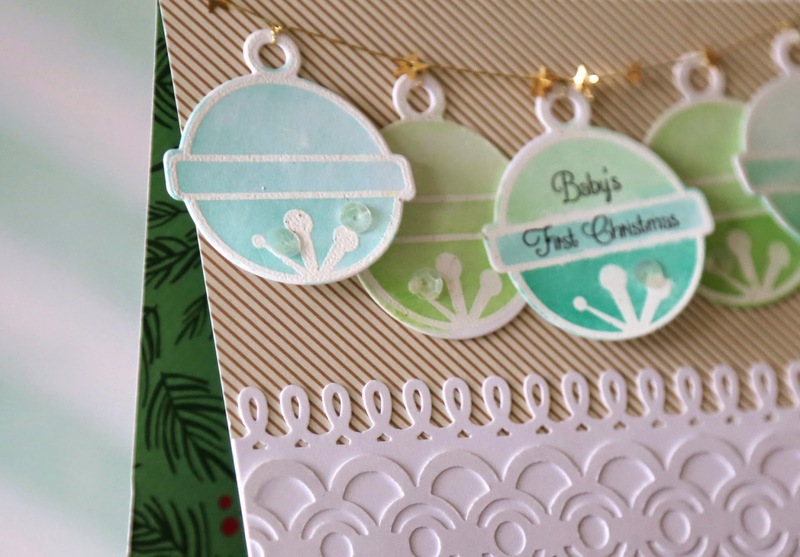 Today we're revealing Sleigh Bells and Bell Tag, a Christmas stamp AND die set for CAS-ual Fridays Stamps. Such a fun one! I adore the sleigh bell and die, and all the little sentiments you can fit onto it. 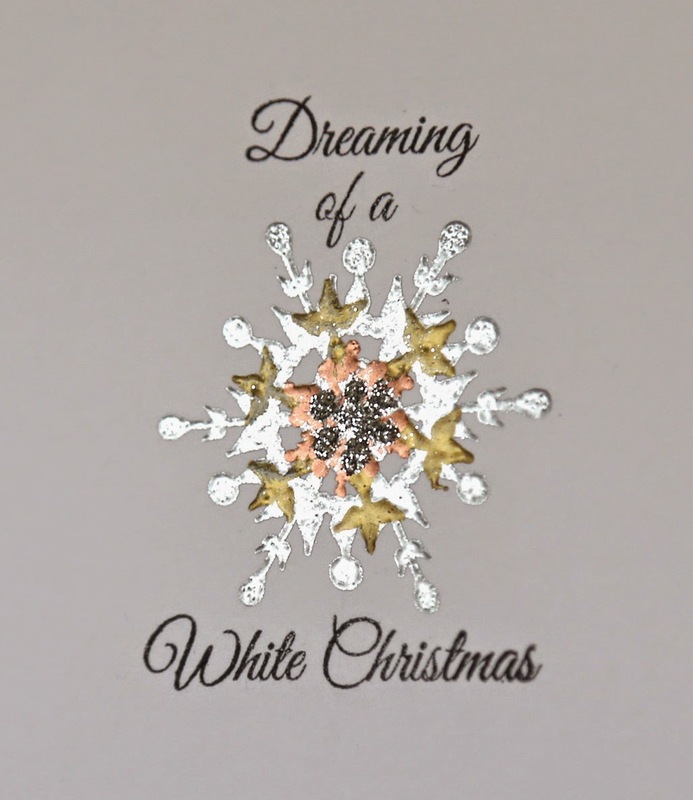 The sleigh bells are embossed in white, die cut, and then given a wash of watercolor. I started at the bottom of each bell and gave it more shading there. I'm so excited with the sentiments in this set ... out of all my stamps, this is the first and only "First Christmas" stamp I own. The bells are strung on gold thread with tiny gold stars in between. I put foam tape behind the darker bells so they fall in front of the green bells. The double sided paper is American Crafts, and the punches used on the white strips in front are Martha Stewart. Thanks for looking, and come back over the rest of the week to see what else is new!! Hi Folks! Are you ready for the fourth day of the new CAS-ual Fridays Stamps release? This set has some great pinecones, but there is also a pine tree sprig that I am MADLY in love with! 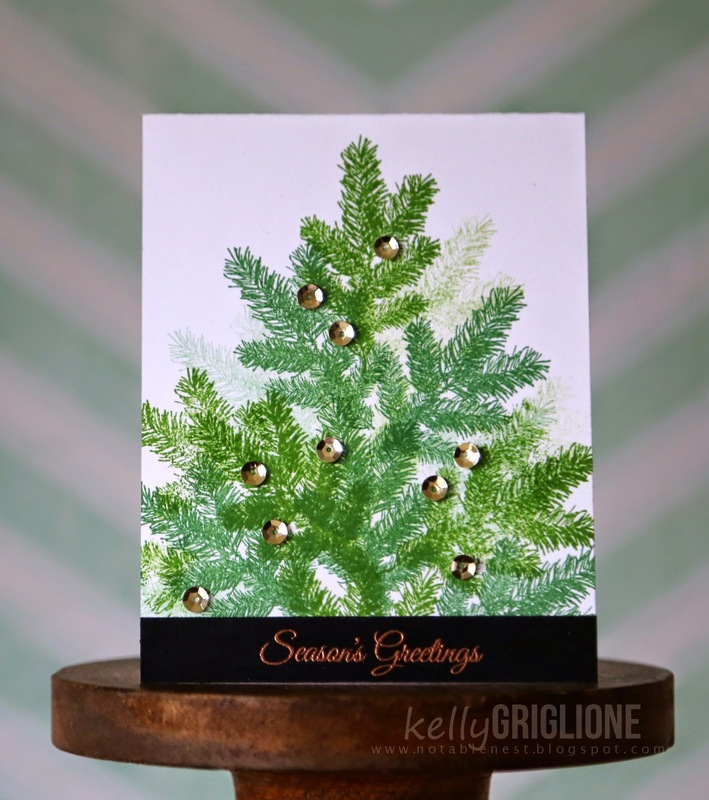 I stamped it three times to make this adorable little Christmas tree, plus a few more generational stampings. 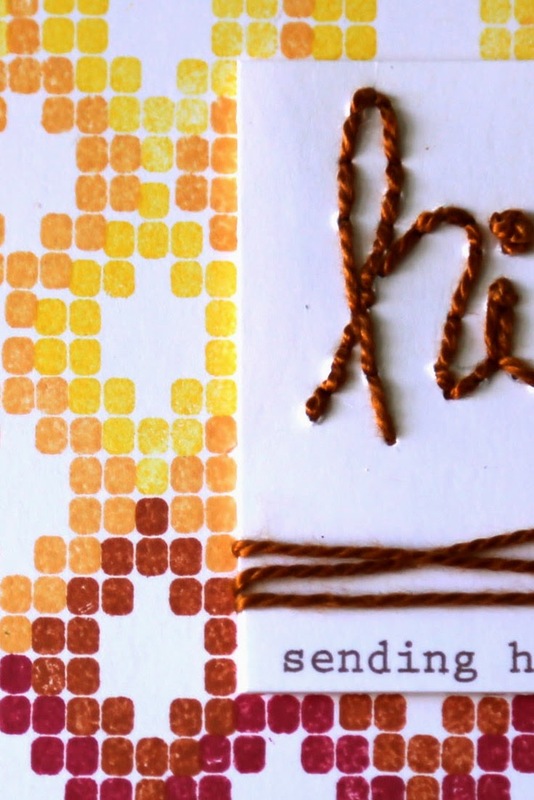 The greeting, which also comes in the set, is embossed on a strip of red paper that I just notched the ends. 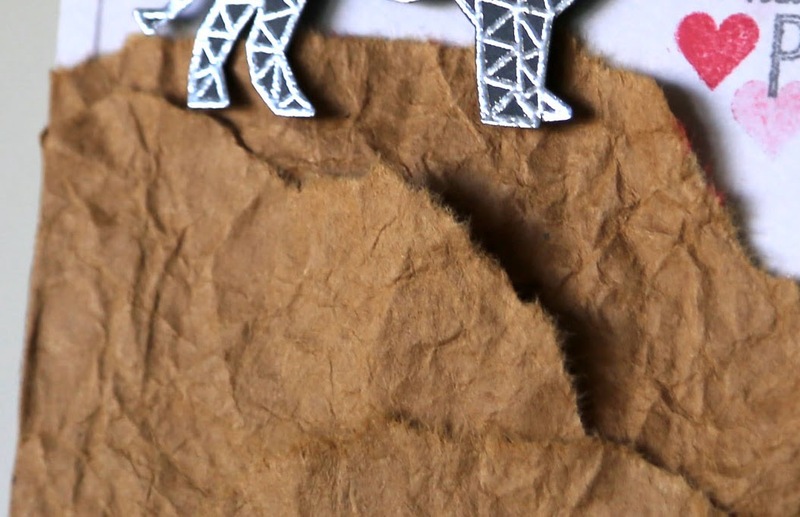 Woodgrain paper makes a nice little trunk, the seam of which is conveniently hidden under the banner. 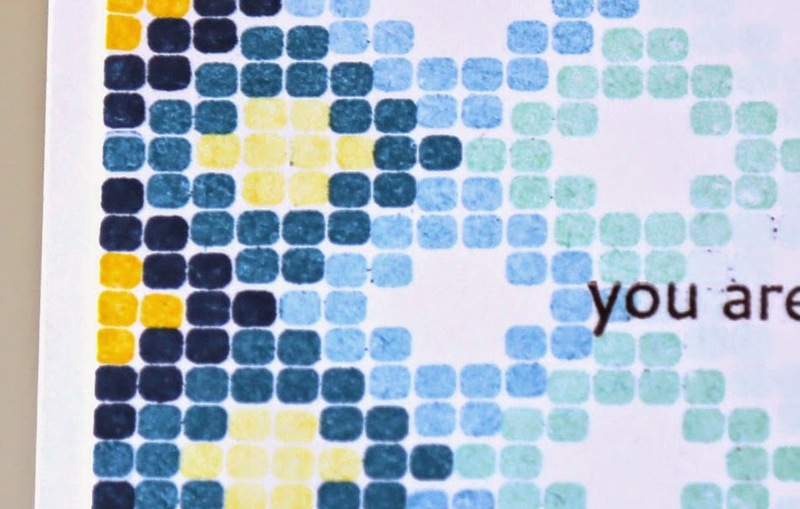 The embossed dots on the bottom are my representation of a snow-covered ground. And finally some blue and white polk-a-dot on the inside finishes it off. Like the wheat wreath stamp from the first day of this release, I love the pine branch so much that I kept playing around with it. 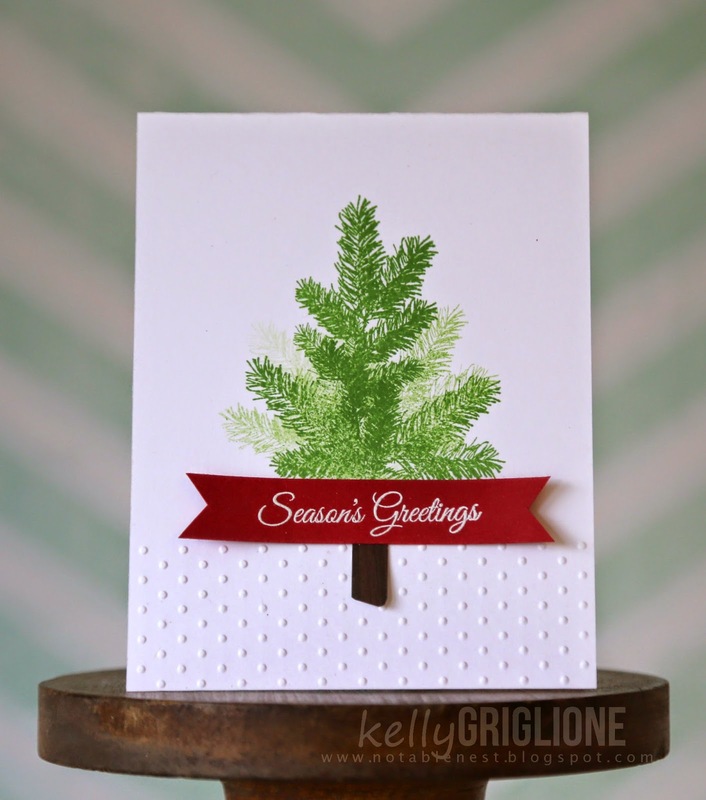 I LOVE how easy this Christmas tree is to stamp, yet the finished tree fills such a large part of the card base. 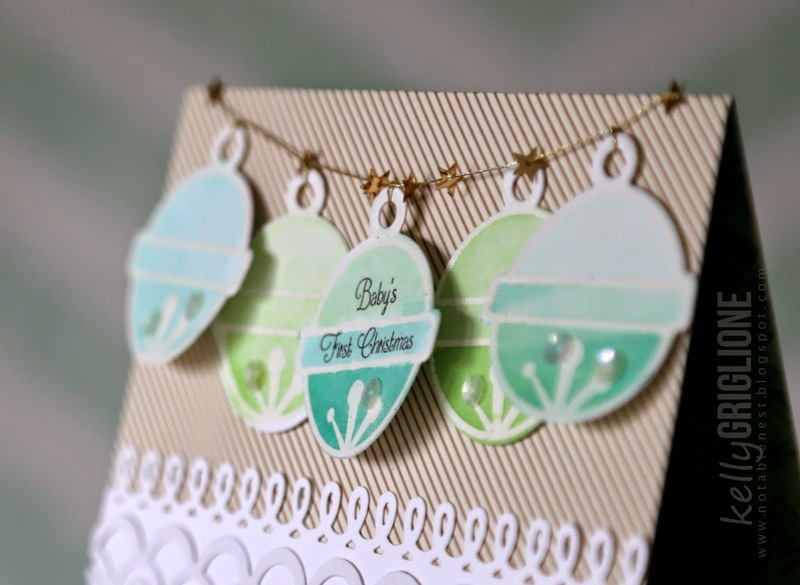 There are two different inks used here to make the tree a little more realistic, and some generational stamping as well. The sequins are vintage (they have such a rich finish to them ... in between gold and bronze) and the sentiment is embossed in bronze. Thanks for looking, and come back if you can to see what else is new!! My New Favorite Birthday Card ... Happy Dances, Bev! 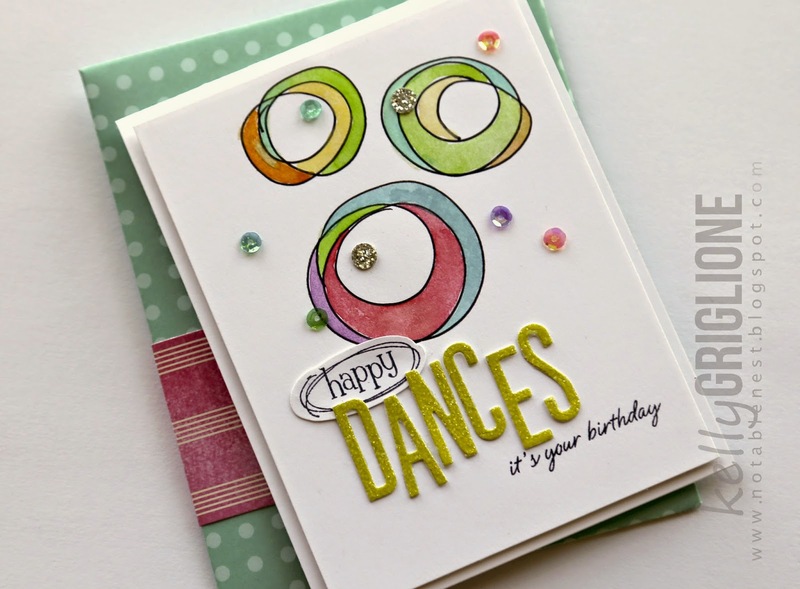 It's my pleasure to wish Bev of Happy Dance a fabulous birthday! She doesn't always have it easy in life, but she always comes to the table with a positive outlook, and it's quite infectious. You can't come away from her blog without a huge smile on your face! I was so excited when I saw it ... my mom and I used to pass the time coloring like this when I was a kid. When we ran out of coloring books, she would draw a large scribble and then we would color in the sections. So simple, but it was SO FUN!! I didn't have Bev's scribble stamp, but was excited to try my own doodles. They're a little wonky, but I'm telling myself that it adds to the whimsical feel : ) Also, since all my Spectrum Noir alcohol markers have dried out (so not happy about this!!!) I used watercolor instead. The softer feel ended up working out for this card. Here's the paper inside ... it's American Crafts. The sentiment is die cut from AC glitter paper. 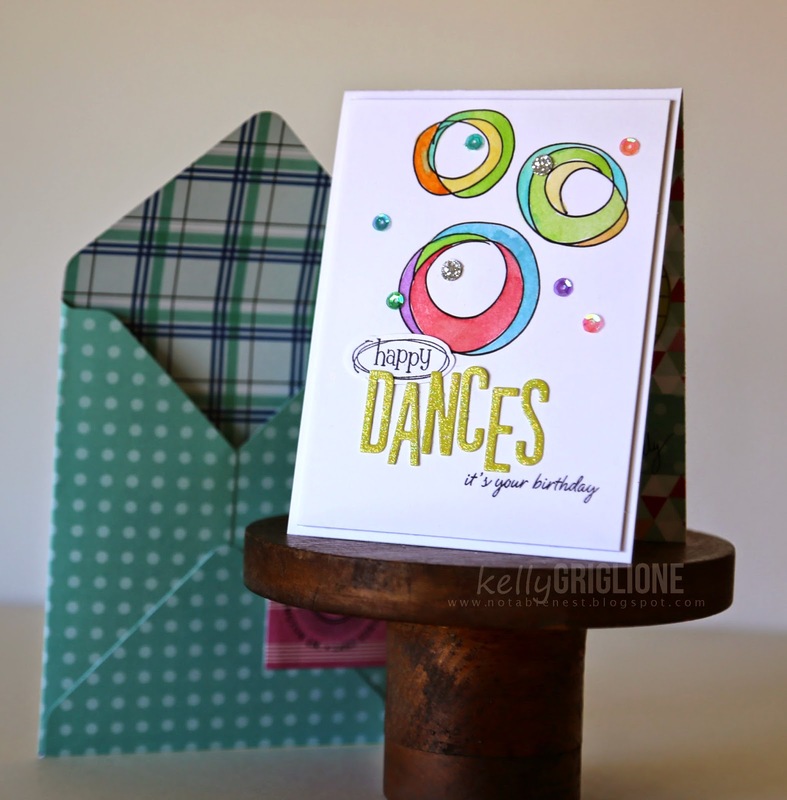 I was pleased to find a "happy" sentiment with a doodled circle around it, although I guess I could have added that doodle around another "happy" stamp. The small "it's your birthday" is from Winnie & Walter's Bubble Talk. I didn't have that stamped at first, and the card looked unbalanced. Now I'm happy, and in fact, I think this is my new favorite birthday card! Here's the envelope I made for it. A few of us (who were organized by the ever-thoughtful Darnell) are posting our cards on gracious Ardyth's blog if you want to stop by and add your own well-wishes. Anyway, thanks for sticking with this longer post. Happy Birthday, Bev!! Hi Folks! We're in the middle of a huge release for CAS-ual Fridays Stamps ... it's the third of SIX days of fun new stamps and dies. Today we get to reveal the Must Love Snowflakes set, and all the wonderful sizes and patterns of snowflakes included. 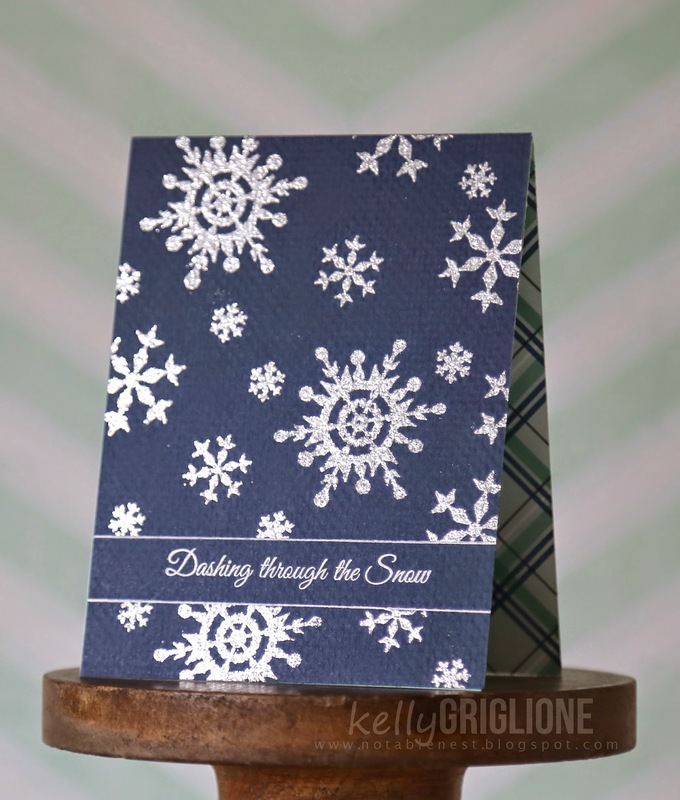 For this one-layer card, I masked off a strip for the sentiment, and then stamped varying sizes of snowflakes throughout the card with Versamark. The embossing powder is Silver Sparkle so it does catch the light when you move it around. 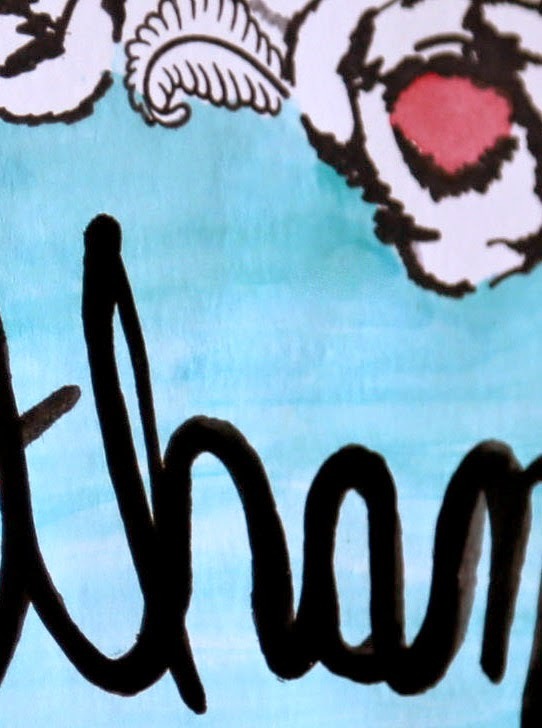 To make the sentiment stand out more I embossed it in bright white, and then drew two lines with a white gel pen on the top and bottom of the masked area. 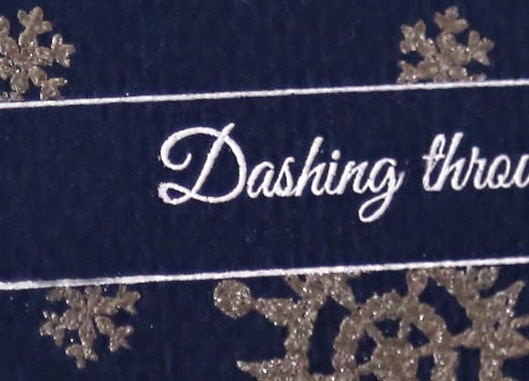 My intent was for the sentiment to be "dashing through" the snowflakes on the card. 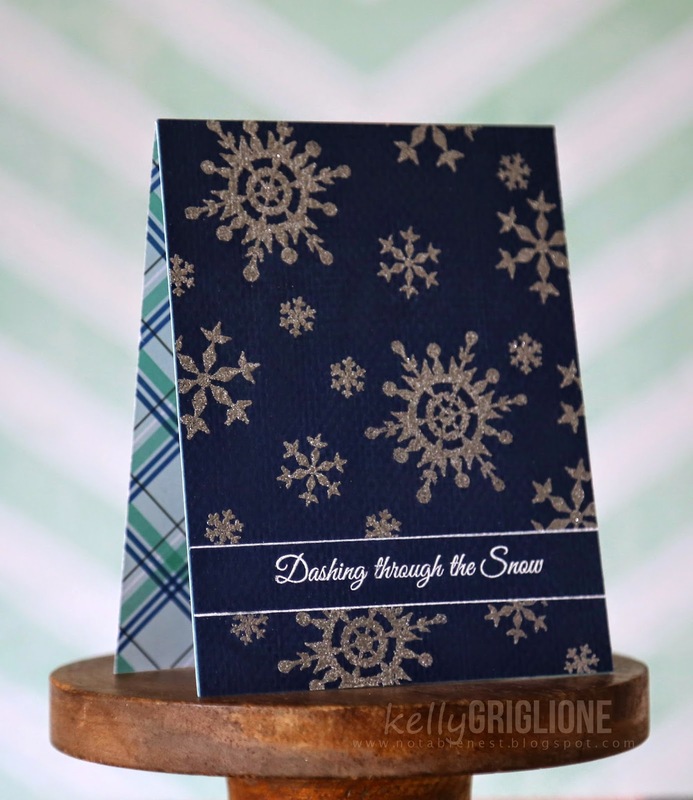 Since the front is just one layer, I was hoping to add a little zip by using a plaid patterned paper inside the card. ETA: I totally forgot to post this card too, holy smokes! It's very simple, but I wanted all the white space to go with the "White Christmas" sentiment. There are four different snowflakes here, all embossed in different colors and layered on top of each other. The middle is Martha Stewart glitter. Thanks for looking, and see you tomorrow with another fun Christmas set!! Hi Folks! We're in the middle of a huge release for CAS-ual Fridays Stamps ... it's the second of SIX days of fun new stamps and dies. Yesterday we covered fall, now settle in for five more days of Christmas and Hanukkah!! The snowflake tree in this set is so cute! And why not make some in pink, right? These actually have two shades of pink and then Lady Bug Red on the bottom. I used the gold foil to extend the trees a little, and to make the center tree a little bigger than the other two. The center tree is also mounted on chipboard to give it some dimension. 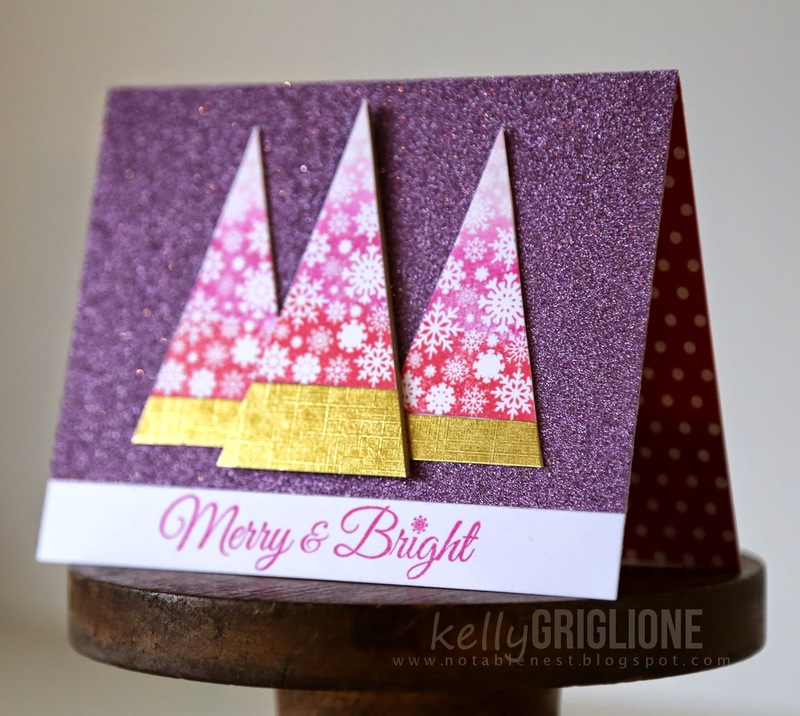 The glitter paper is American Crafts POW and man is that a nice paper! It's got a very thin, plastic-ey backing which makes it nice for die cutting, and the glitter is part of the paper so it never rubs off. I got a great deal at a discount store and have a lot of it, so I need to start using it. I like how the color is a little non-traditional, yet goes with the pink and red. The inside is lined with a red and white dotted Pebbles paper. We're SO EXCITED to have Deepti, Marcie and Zoey join our team!! Hi folks! 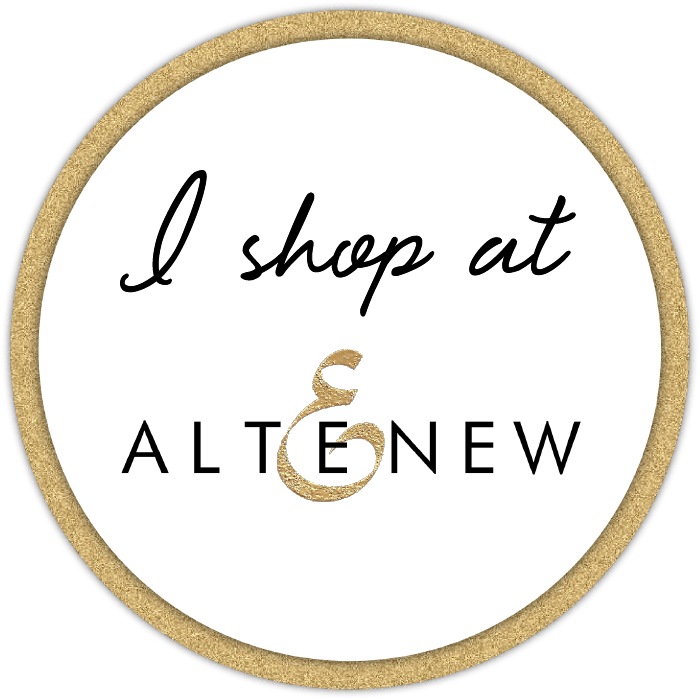 I'm so thrilled to have been invited to appear on the incredibly popular Altenew blog and share some new cards designed with stamps from their second release. 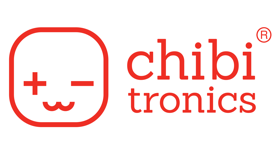 It's really amazing how they've only had two releases so far, but if you check out their store you'd think they've been around for years with the variety of products they have. They are just that good! If you'd like to see, head on over to check out my guest post!